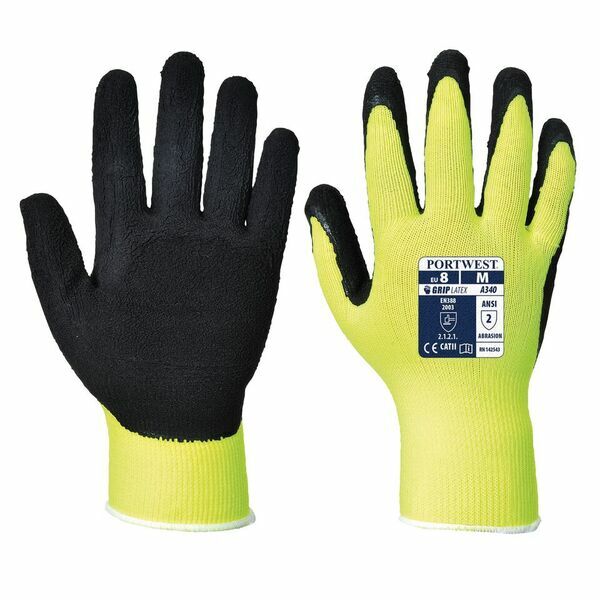 With exceptional grip and impressive mechanical protection, the Portwest Hi-Vis Grip Yellow Gloves A340YE (Case of 240 Pairs) excel in general handling applications. They feature brand new foam latex technology that offers both grip and comfort, while their hi-vis nylon liner ensures visibility in dimly lit conditions. The Portwest Hi-Vis Grip Yellow Gloves A340YE are popular gloves, and with this offer you can buy a case of 240 pairs at a discounted price. Ideal for businesses that require high levels of health and safety, this offer lets you save money on your essential safety wear. To purchase these gloves in a single pair, please see the standard listing. The Portwest Hi-Vis Grip Gloves offer excellent mechanical protection while boosting productivity in general handling applications. They are fitted with a latex foam coating that works to enhance grip, while their nylon liner is ideal at providing dexterity making them perfect when handling materials.